The State of Games, Episode 4 is good to go! We may be playing around a tiny bit with the format this week, but we’re still here to talk about some subtle controversies; only this time, we’re inviting all of you to look deep inside your gaming souls and seek out the sin within! So yeah, The Road to Canterbury is based on Chaucer’s poem, The Canterbury Tales. Dear readers and listeners, you can get a sneak preview of the box cover art for this upcoming game and learn a bit more about Alf and his many passions in the in-depth Dice Hate Me interview over here. 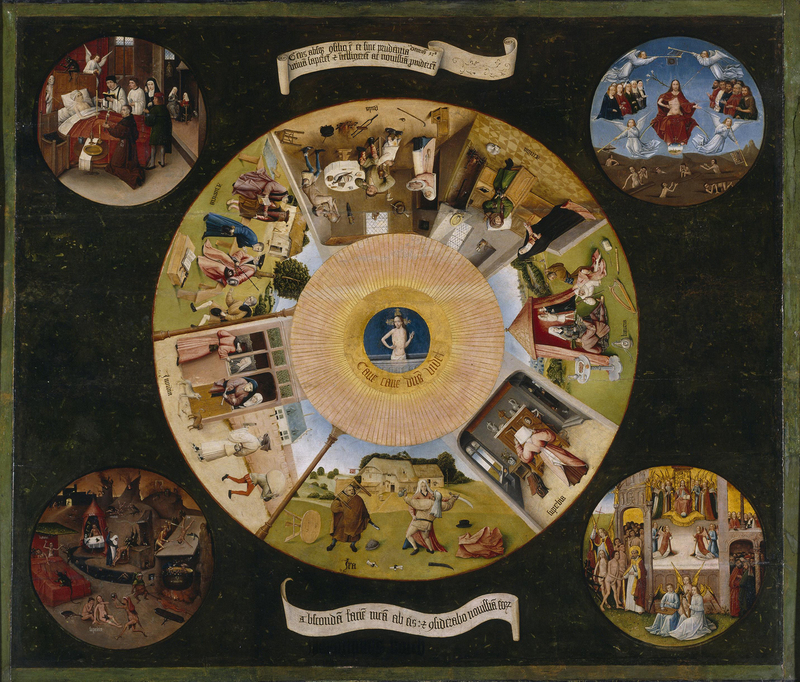 Also mentioned in the podcast is Hieronymous Bosch’s famous painting The Seven Deadly Sins and the Four Last Things, a sample of which can be seen on the right. To learn exactly what that has to do with The Road To Canterbury – well, you’re just going to have to listen to the podcast! And, while we’re mentioning Alf and his projects, be sure not to miss the Dice Hate Me review of the delightfully whimsical Trollhalla. Love your podcast, but any chance of it getting to iTunes soon? It’s where I (and I suspect many others) look to consolidate all our podcasts with. Ignore my previous comment please. Just noticed it is available in iTunes! Great! Although there was not much talk about Egizia in this podcast, you did quickly mention it and the tension that grew between the two of you with the Water Ring. Anyway, I just wanted to say, when I see the two of you, count me in on a game of Egizia. I’ll play it with you. Shawn – Sounds awesome – we’d love to play Egizia with you! Lucian – Glad you found it, and thanks for listening! Just listened to your show today–great stuff! Will you guys be at Origins or GenCon? Philip – Thanks for the kind words, and for listening! I will, indeed, be at Origins this year. Monkey will be holding down the homefront, however. Look for me – I’ll be the guy in the Dice Hate Me t-shirt. By the way, I love the story of Isabel and Tiger Stripes – she seems like a real sharp kid! Awesome–I’ll be wearing a Revolution! shirt. Philip – Hah! That’s very appropriate. Interestingly enough, I will be getting in my first plays of Revolution! this weekend at MACE West. Scott Suehle is a Man in Black and he’s bringing a copy so I can try it out. I’ve been wanting to play since it was first released! Excellent episode. I think you did an good job of covering the topics. Thanks for the mention of Gameathonapocaloozafestacon. That was a good game of Homesteaders. If only I had had more $$! Trollhalla sounds fun. We need to play. As does MoM. I’ve never play Twilight Struggle though I really would like to. Egizia – played on Yucata.de but not in person. I need to catch Shawn at game night with it. Speaking of Shawn, you can meet him at Big Ole Game Day. And we can play Egizia! I’m grinning as I listen to Trololo at the end of your podcast! Well done and clever reference to Trollhalla. Your discussions on the 7 deadly sins had me thinking about how those sins reveal themselves in my gaming. I imagine it might affect my future gameplay. Any chance you two will make it out to bgg.con this fall ’cause I’d love to catch a game with you there? Lee – Thank you! I was really hoping someone would get that reference. Monkey and I were just talking about bgg.con and we would really like to go, but I don’t think we’ll be able to make it this year. We’re already budgeting a trip out west and with my trip to Origins in the summer, we’re just about tapped out. Are you going to any other cons? No others for me. In fact, I’ve only been able to attend bgg.com the past few years since it’s local for me. Perhaps another year then.